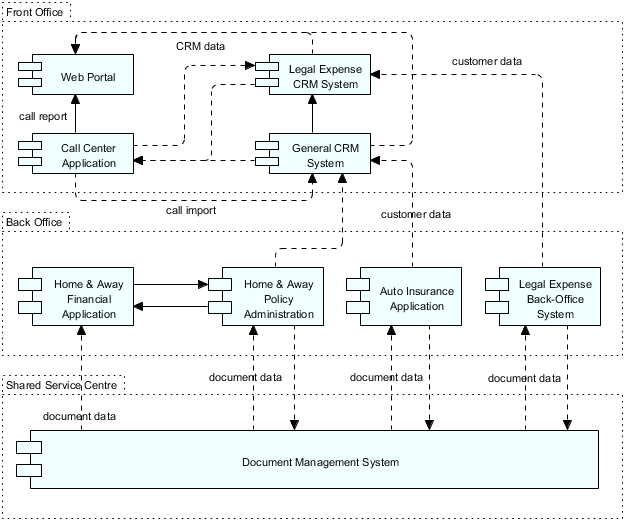 This ArchiMate diagram presents a roadmap from Baseline Architecture state (Scattered CRM systems and Back-Office Systems) to Target Architecture state (CRM, Data, Warehousing and Doc. Mgmt Back-up Server In-Place). It consists of two Transition States, A and B. The architecture work required by both Transition Architectures will be performed simultaneously, as indicated by the And-Junctions (The black dots). The gap between Architectures are represented by gaps (shapes). 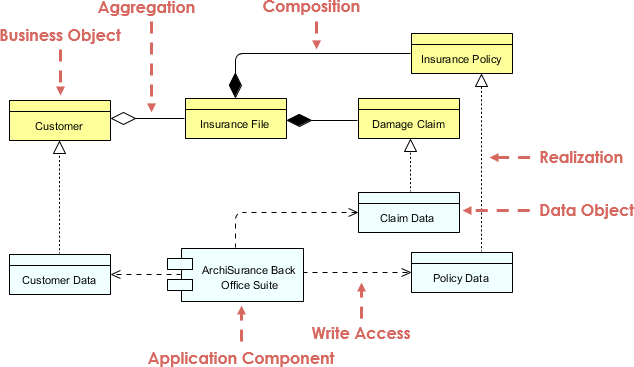 The work packages required to realize the planned outcome are associated with the corresponding gaps. 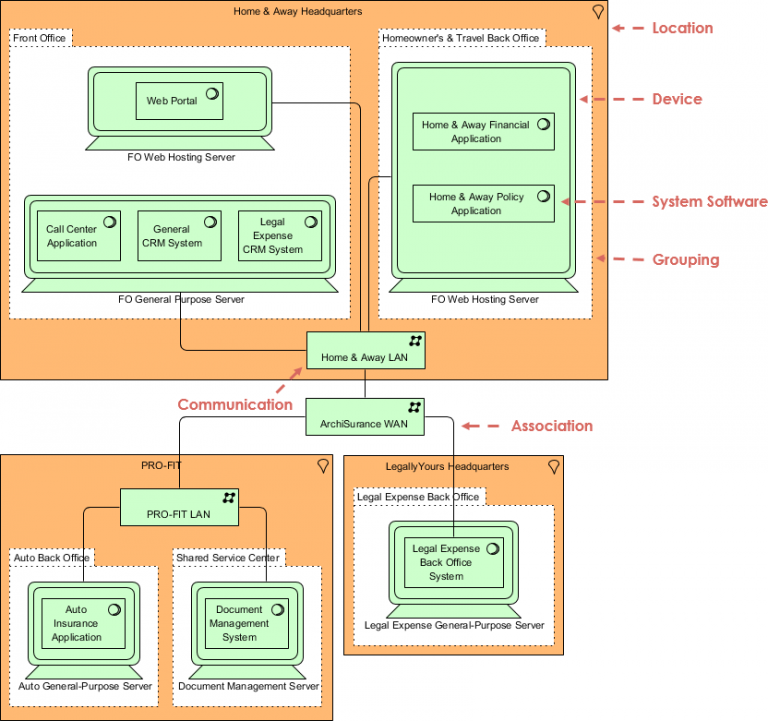 The target Technology Architecture diagram describes the software and hardware infrastructure elements that support the target Application Architecture, such as physical devices, networks, or system software, including operating systems, databases, and middleware. 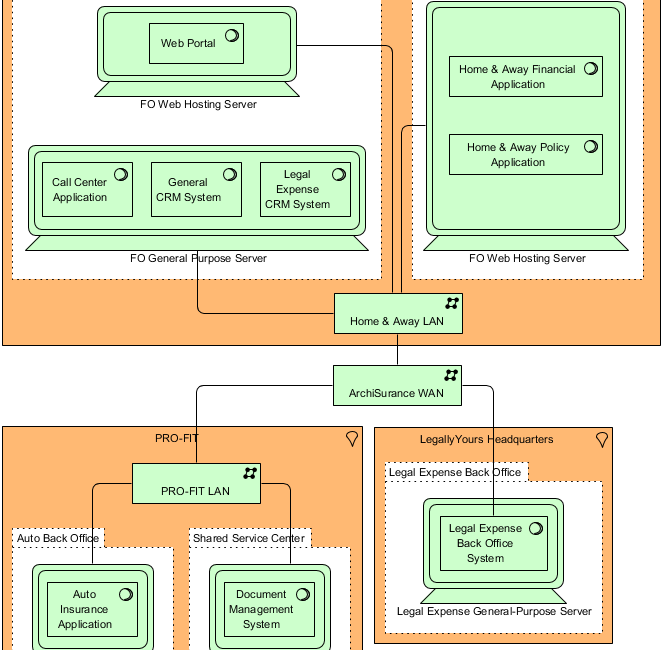 The baseline Application Architecture diagram describes the relationships between application components based on the information flows between them, or the services they offered and used. 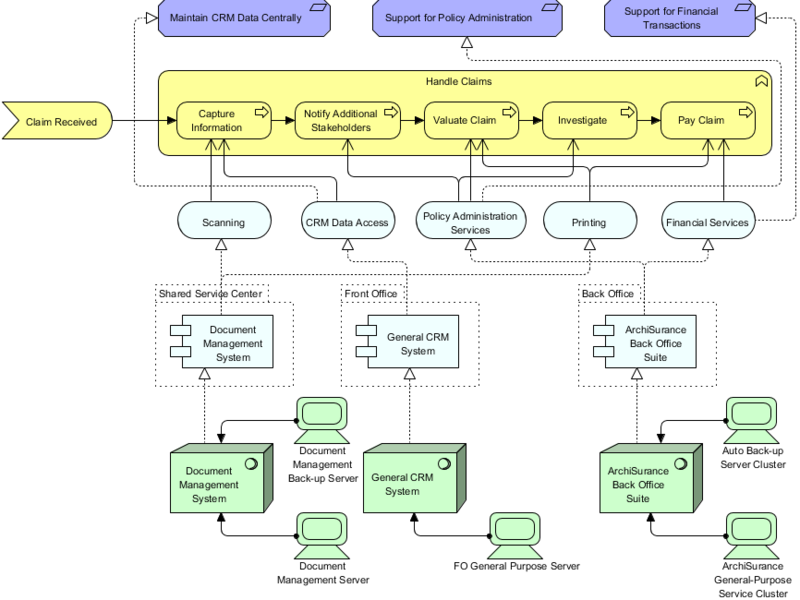 This diagram is typically used to create an overview of the application landscape of an organization. This is also used to express the (internal) co-operation or orchestration of services that supports the execution of a business process. 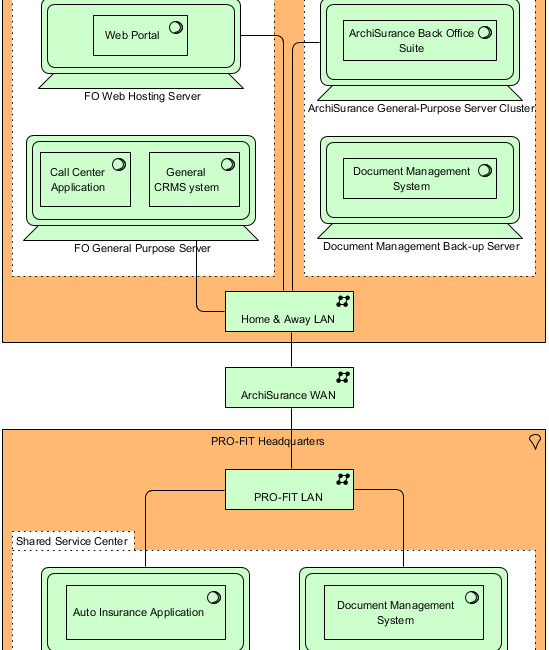 The target Application Architecture diagram describes the relationships among application components in the target Application Architecture, in terms of the information flows between them, or the services they offered and used. 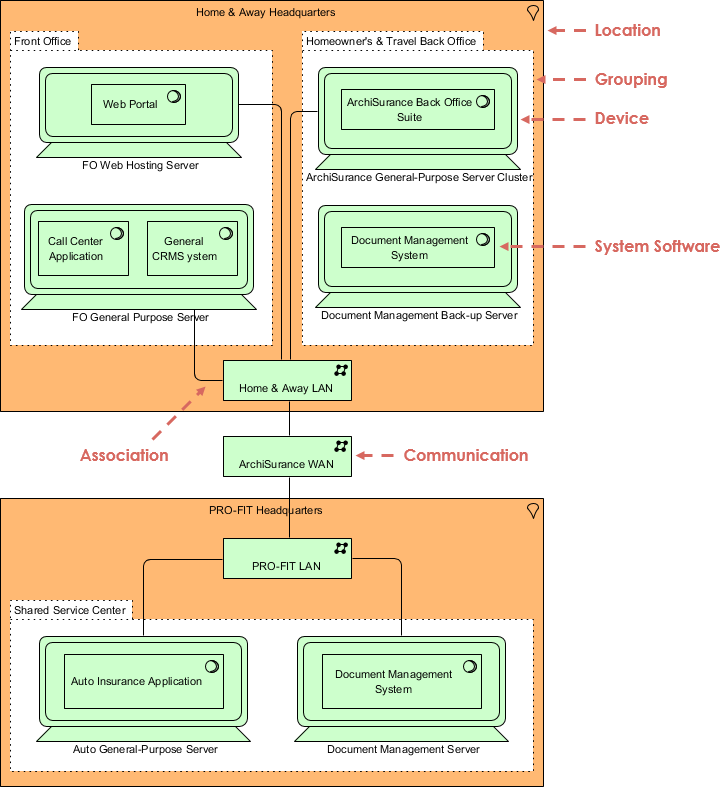 This diagram is typically used to create an overview of the application landscape of an organization. This is also used to express the (internal) co-operation or orchestration of services that support the execution of a business process. This is a baseline Technology Architecture diagram. In the ArchiSurance front office, located at the Home & Away headquarters, there is a general-purpose server and one dedicated to web hosting. The Shared Service Center (SSC), located at the PRO-FIT headquarters, has its own server for the document management system. Each of the three back offices has a server for its applications. 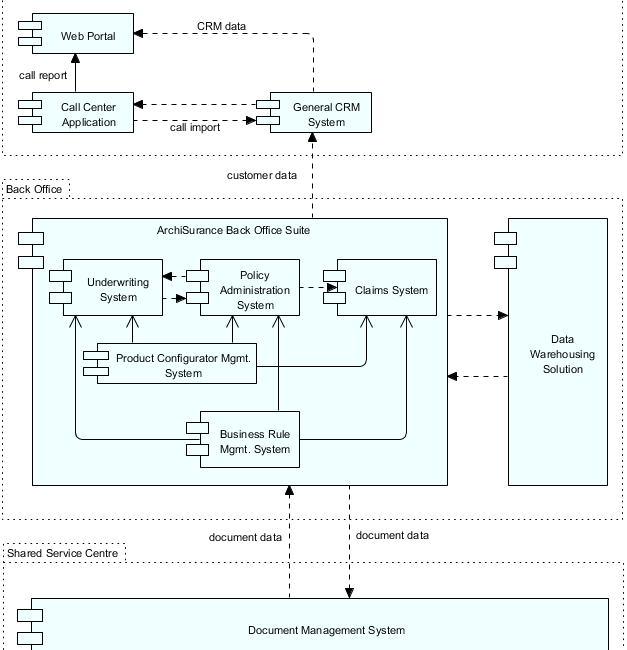 The baseline Data Architecture diagram shows the information used in the enterprise or in a specific business process or application. In most cases it will not involve all data models as you will only focus on those application components that will be changed from baseline to target architecture. 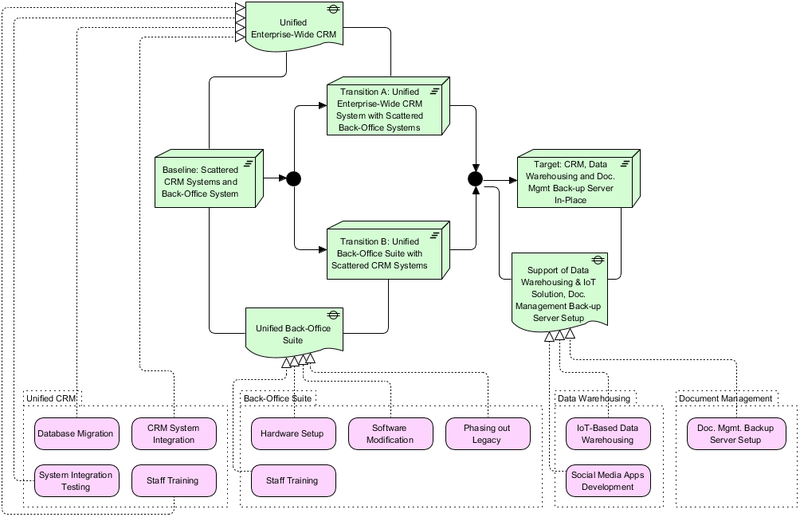 The Conceptual Data Model is comparable to the traditional information models created in the development of almost any information system. 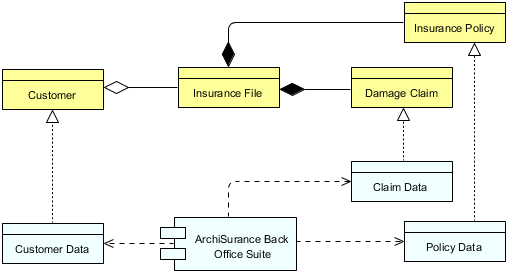 It shows the structure of the information used in the enterprise or in a specific business process or application, in terms of data types or (object-oriented) class structures. 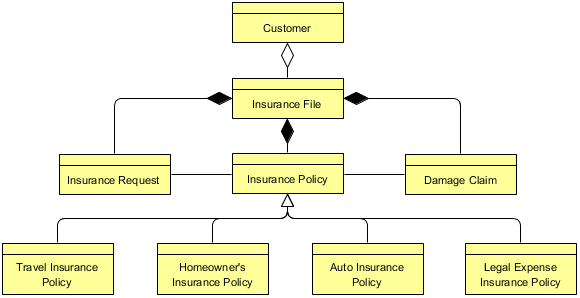 Here we only need to create a high-level information model or people often call it conceptual model in data modeling term. 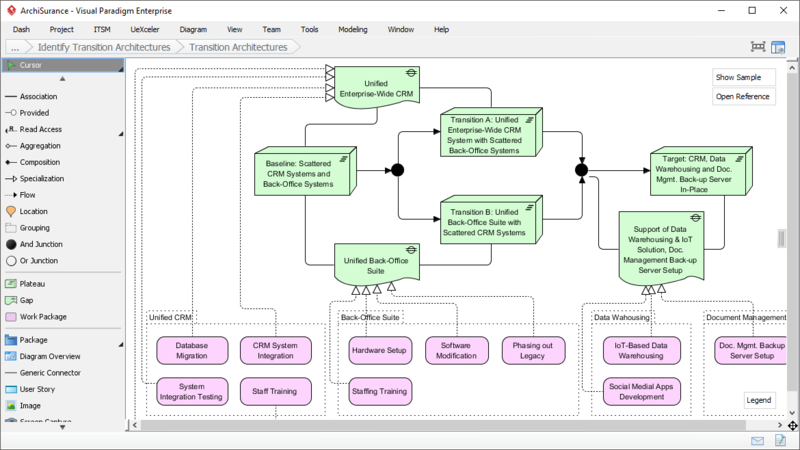 The Target Business Architecture provides the details of a future state of an architecture being developed. Relate all the requirements, processes, services, application components and technology system to each other along with the business processes. 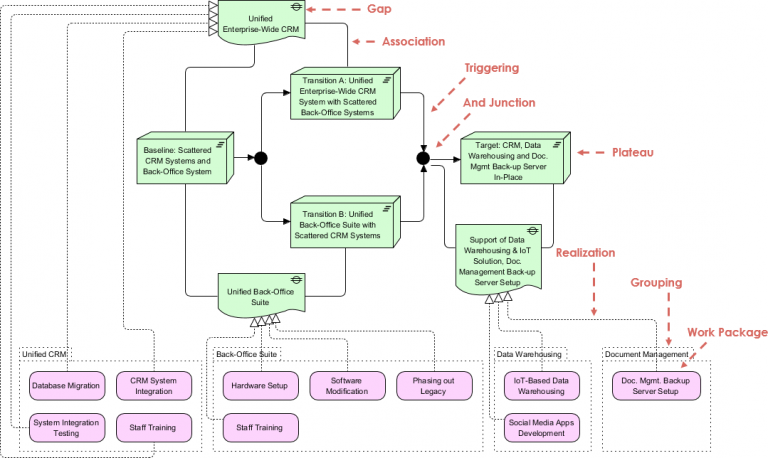 This allows you to validate whether the proposed target architecture will fulfill the business. 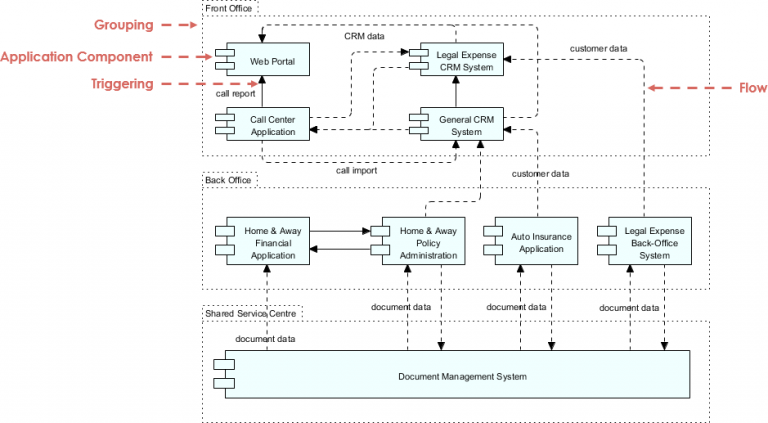 This ArchiMate diagram identifies how business functions are supported by application services today. 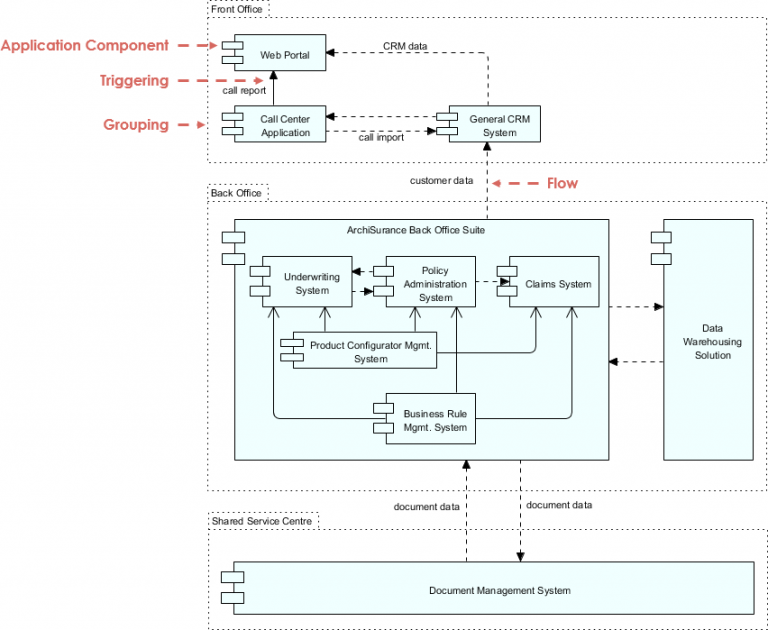 It involves business processes (elaborated from business functions), the application services and components. 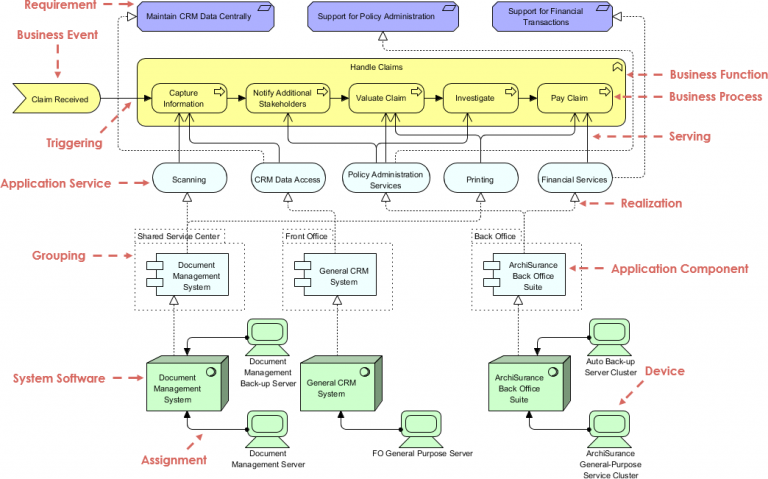 By performing this step, you will be able to determine whether services are required to be re-mapped in order to eliminate any duplication, or if subsequently merged to introduce any new application system.